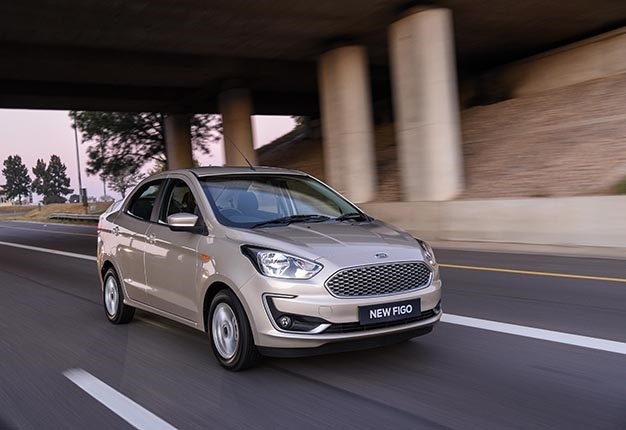 WATCH: Kona, Swift, E-Pace... 2019 SA Car of the Year semi-finalists - here's how some of SA's top cars will battle it out! 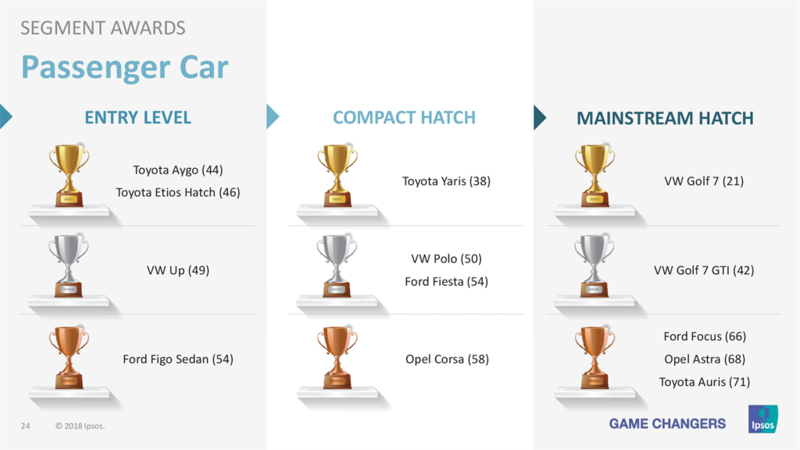 Toyota has grabbed 13 gold awards in the latest Ipsos Vehicle Quality Awards. 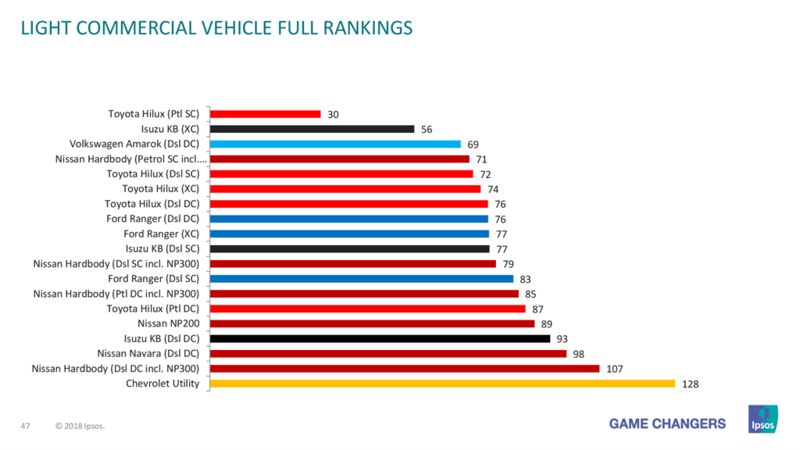 The Ipsos Vehicle Quality Survey (VQS) was conducted throughout South Africa in 2017, involving survey feedback from 7000 owners of vehicles from 16 car brands. 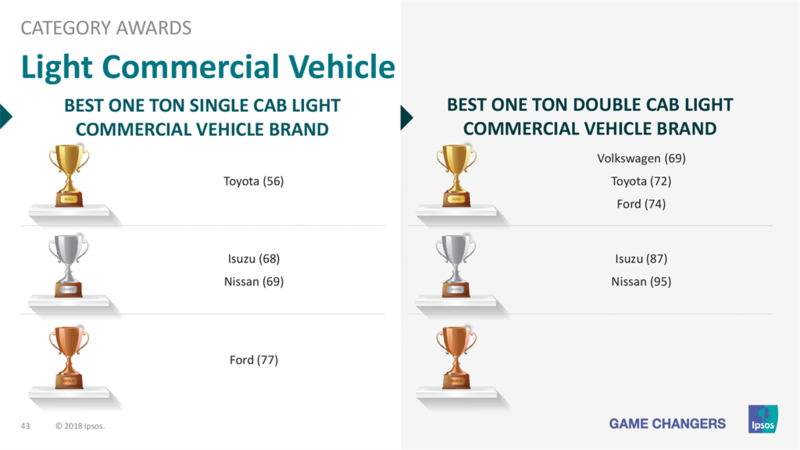 Toyota achieved 13 gold awards – seven for passenger cars and six for LCVs – from 16 categories. 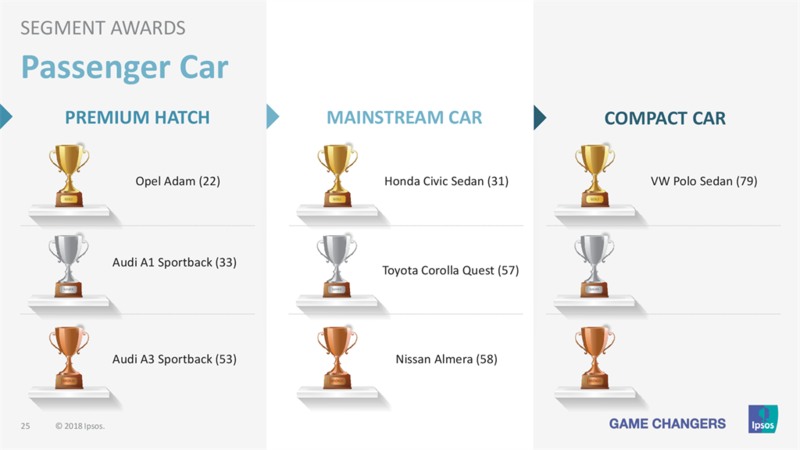 In 2016, the Japanese automaker scooped nine gold awards. 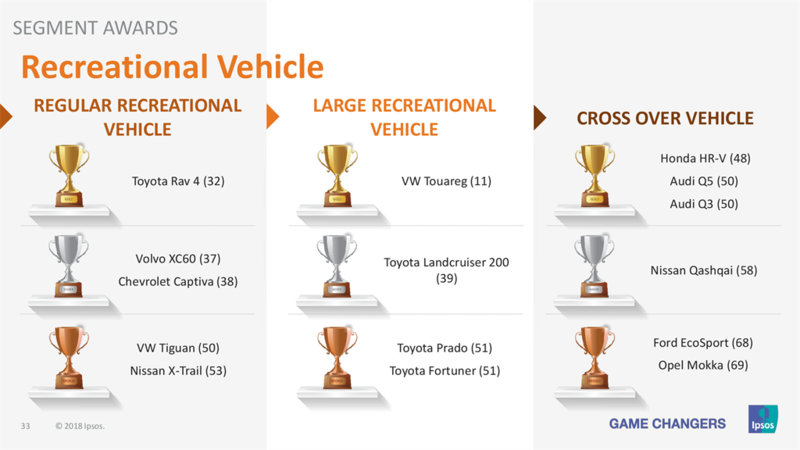 Volkswagen was the runner-up with eight golds in 2017, collecting four in the 2016 survey. 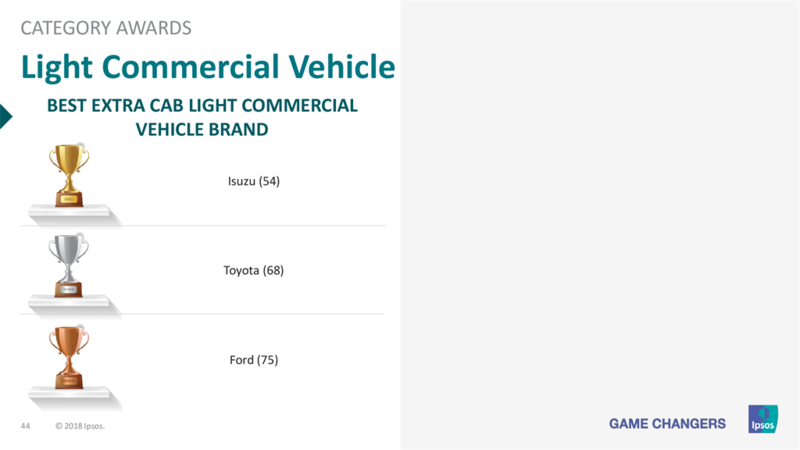 Other gold award winners in 2017, (with the 2016 score in parentheses) were: Audi, 5 (5); Isuzu, 3 (0); Honda, 3 (0); Nissan, 2 (8); Opel, 2 (1); and Ford, 2 (2). 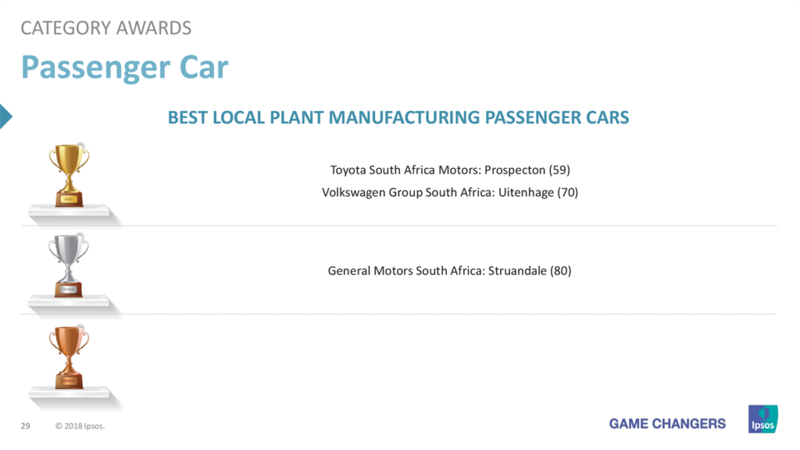 According to Ipsos: "Besides winning awards for individual models, both Toyota and Volkswagen earned gold for their passenger car manufacturing plants. 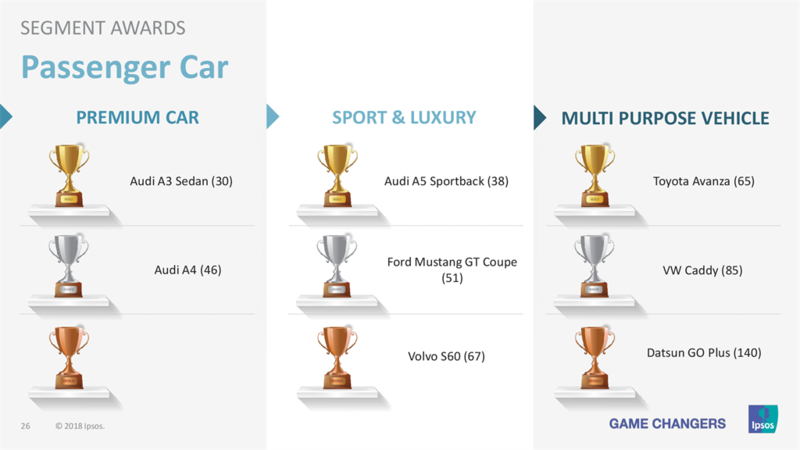 Audi won the gold award for best overall passenger car brand due to Audi as a brand achieving the best combined score across all of their models. 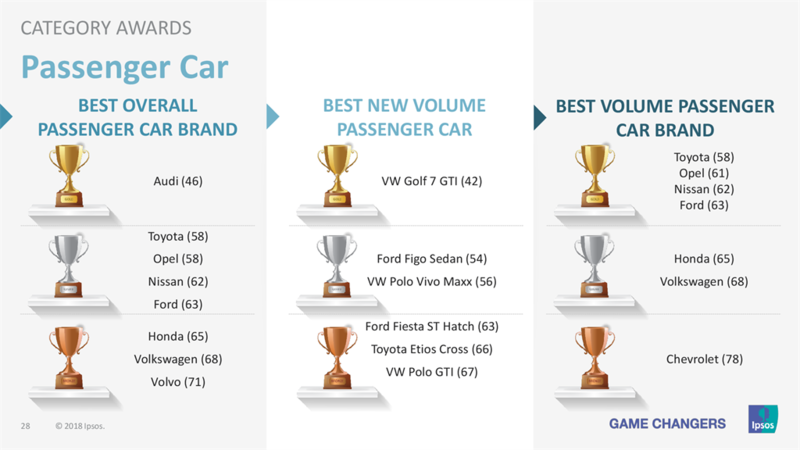 Toyota, Opel, Nissan, and Ford shared gold in the best volume passenger car brand category." score of 23. 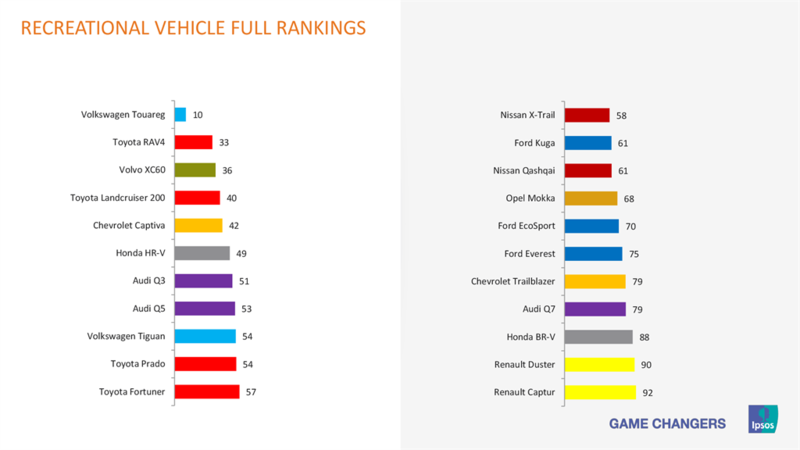 It was followed by the Honda Civic sedan (31) and Audi A3 sedan (32). 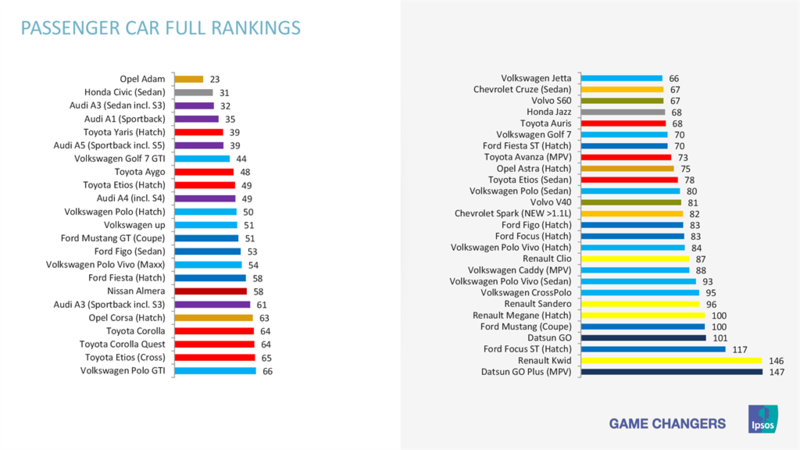 Patrick Busschau, Ipsos automotive director commented, said: "All the participating brands are to be commended for their continued focus on delivering better products to their customers. 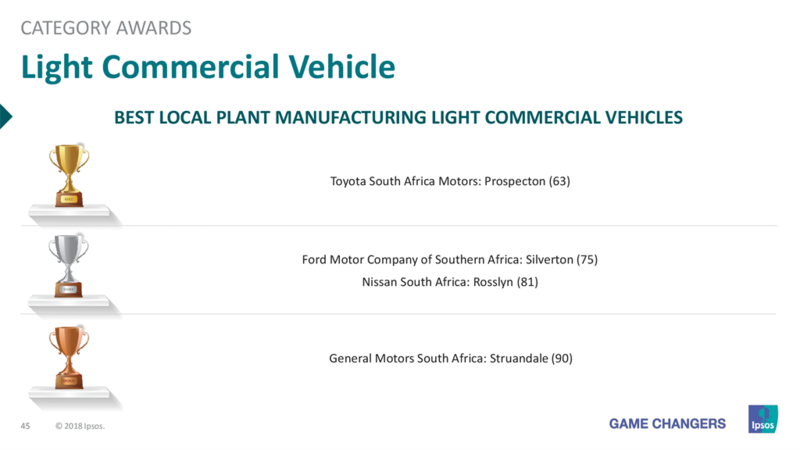 The results are plain to see and it is no coincidence that delivering an exceptional product has a direct impact on these manufacturers’ commercial successes as well." 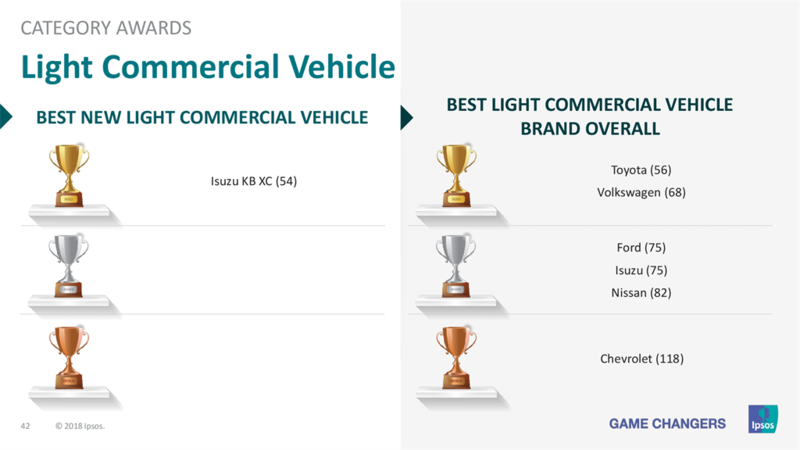 Busschau commented further, said: "Gold Awards winners in particular are to be congratulated for their consistent efforts in ensuring that South African motorists have world class products and are getting the value they have paid for." 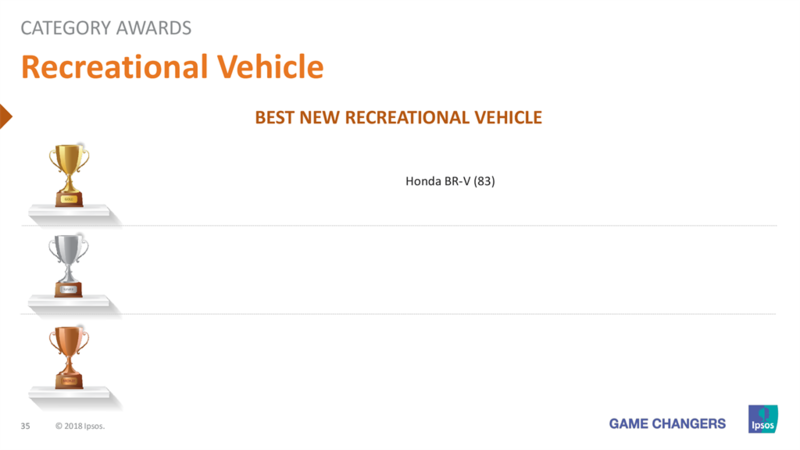 Crossover Vehicle – Honda HR-V (Gold, 48); Audi Q5 (Gold, 50); Audi Q3 (Gold, 50); Nissan Qashqai (Silver, 58); Ford Eco-Sport (Bronze, 68); Opel Mokka (Bronze, 69). 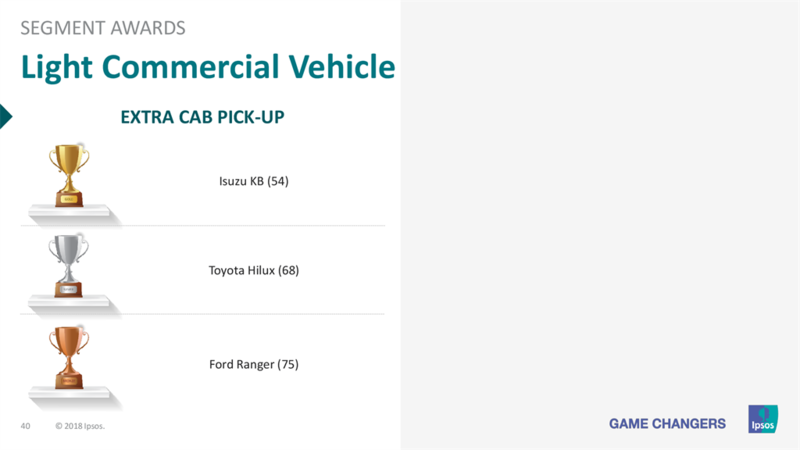 Single-Cab bakkie – Toyota Hilux Petrol (Gold, 22); Nissan Hardbody Petrol (Silver, 65); Toyota Hilux Diesel (Silver, 66); Isuzu KB Diesel (Silver, 68); Nissan Hardbody Diesel (Bronze, 75); Ford Ranger Diesel (Bronze, 77). 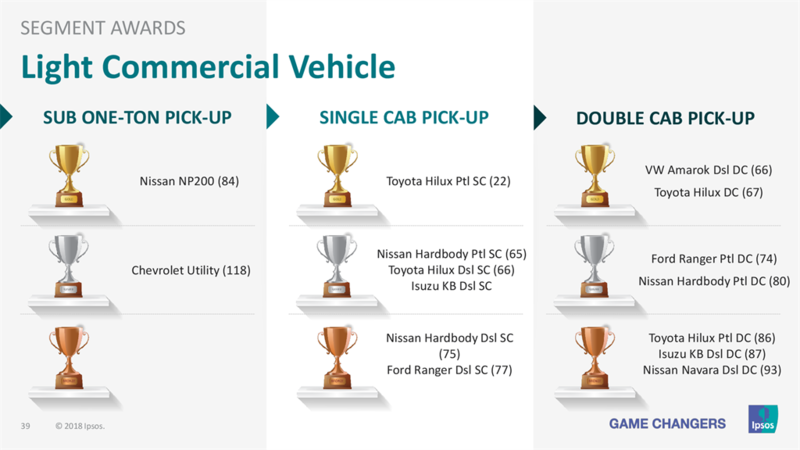 Double-Cab bakkie – Volkswagen Amarok Diesel (Gold, 66); Toyota Hilux Diesel (Gold, 67); Ford Ranger Petrol (Silver, 74); Nissan Hardbody Petrol (Silver, 80); Toyota Hilux Petrol (Bronze, 86); Isuzu KB Diesel (Bronze, 87); Nissan Navara Diesel (Bronze, 93).